Here is a picture of a scooter built using a honda spree 50cc engine and drive. It has electric start, front and rear brakes, brake light, head and tail lights. It will do 35mph with a 250 lb. person or persons riding it. it is very dependable and easy to control. The owner is now working on a 150cc four stroke water cooled version. All of the electronics (battery,ignition module, etc. )is located under the deck, out of harms way. 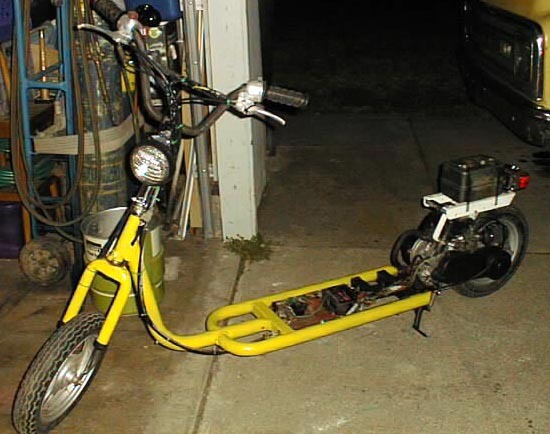 It was made by simply chopping the motor and mount from a honda spree 50cc and attaching it to a scooter frame, which in this case, is made out of some trampoline legs. As for gear ratio, it's all stock honda. So whatever was on the spree...thats it.